Have you always wanted to design your own crochet patterns but don’t have a clue how? I’ve reviewed the perfect book for you! Read on to see what I thought of Design Your Own Crochet Projects by Sara Delaney. Design Your Own Crochet Projects walks you through the whole process of designing crochet patterns. From picking and swatching yarns to calculating the number of stitches, rows and pattern repeats to use. The book also includes a number of crochet projects made by the author Sara Delaney, for you to see how these initial calculations, translate into a full pattern. The book starts off by explaining different types of yarns, which I found very strange but all soon became clear! It turns out the foundations of designing a project all depend on the yarn. Different yarns will drape differently when worked up with the same stiches and Sara Delaney states the importance of making a swatch. Once you have made a swatch using the yarn and stitch pattern you have decided on, it’s time to grab the calculator. This is the bit I found most interesting. The book has very detailed instructions on how to measure your swatch looking for things like stitches and rows per inch, pattern repeats and even weight. 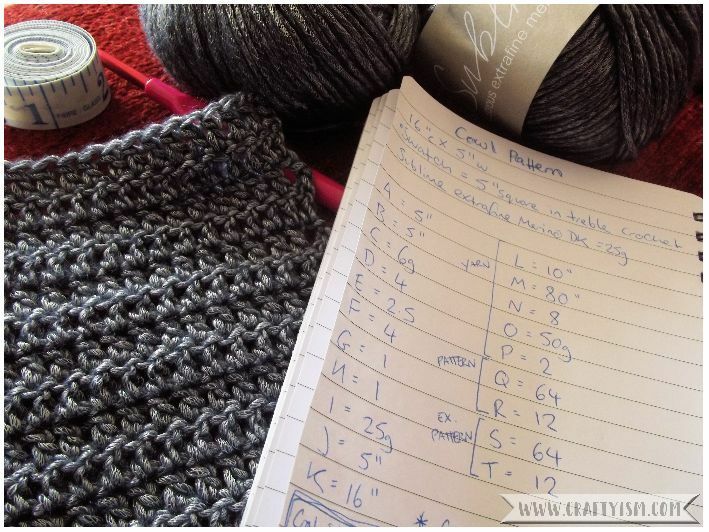 Once you have these numbers, the book then shows some simple calculations that help you to work out how many balls of yarn you will need, how many chains to start with and how many rows you will need to work to complete your project. Designing patterns has always seemed a bit like a mystical art to me. I wondered where people learnt how to do it and how to compensate for different sizes. Well thanks to Design Your Own Crochet Projects, I am one of the people in the know! There’s something very satisfying about choosing a yarn, picking a stich that suits and then making up your own project. Admittedly, I have only attempted an easy cowl pattern, I’m not sure if I would be as successful with something like gloves. But I have confidence that this book will break that challenge down and make it seem almost simple. I can’t wait to start picking up yarns and not worrying about having a pattern to go with it, now I can make my own!